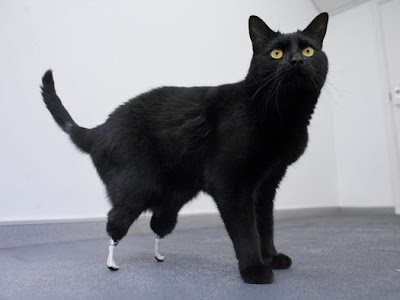 Oscar the cat lost most of his back legs in a harvester accident this past fall. But thanks to some British researchers Oscar is now enjoying a fully functional life complete with two fore paws and two faux paws! Popular Science has more about Oscar: the world's first bionically-enabled feline. It's thought that the technology will soon be applicable to human patients. And here's some video of Oscar strutting his stuff!